Introducing the New CBD Cannabis Vape Liquid from Canabidol™. CBD is the major compound found in all cannabis plants that is responsible for its revolutionary health promoting properties. 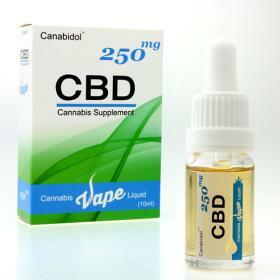 CBD or Cannabidiol, is like a brother or sister to the more commonly known compound THC. However, unlike THC, CBD is non-psychoactive, so is safe as it produces no ‘high’. CBD is 100% legal in the UK as a food product. Recent developments in the understanding of the benefits of CBD and innovations in the extraction processes, have resulted in the explosion of the CBD industry, across the UK and worldwide. Now available in hundreds of health stores and pharmacies nationwide. There are even reports of queues forming at official Canabidol™ stockists, where customers are awaiting the next delivery of products, are becoming commonplace. The popularity of CBD shows no signs of decreasing.